At long last, I have finally made my way to Zak's Chocolate. Don't ask me why it's taken me so long when this is exactly the type of shop I should've been thrilled to pounce on; I may have kept putting it off so that I could continue looking forward to going there. Maybe I secretly didn't want the excitement to end. Well, I've been to the shop, and the excitement hasn't ended. Zak's Chocolate is located in Scottsdale, just off of Shea. Another local chocolate company; wow, Scottsdale, you're spoiling me. (I guess it paid off when I bemoaned the lack of chocolate shops in Arizona a few years ago.) They do have more limited hours than some places, so just make sure to check the hours beforehand. This shop is aimed at a chocolate cafe angle; there is seating available, both tables and a bar by the register. So you can order a coffee or hot chocolate to go with your chocolates and enjoy them there if you like. Zak's uses ethically sourced cocoa and makes all of their products from the bean; you can even buy their cocoa powder (which I'll probably do once I finish what I currently have). I have at least a total of three posts on Zak's coming up. I'm starting with the brownies. If you were going to eat something at the shop, this might be the most likely candidate (though I brought mine home). 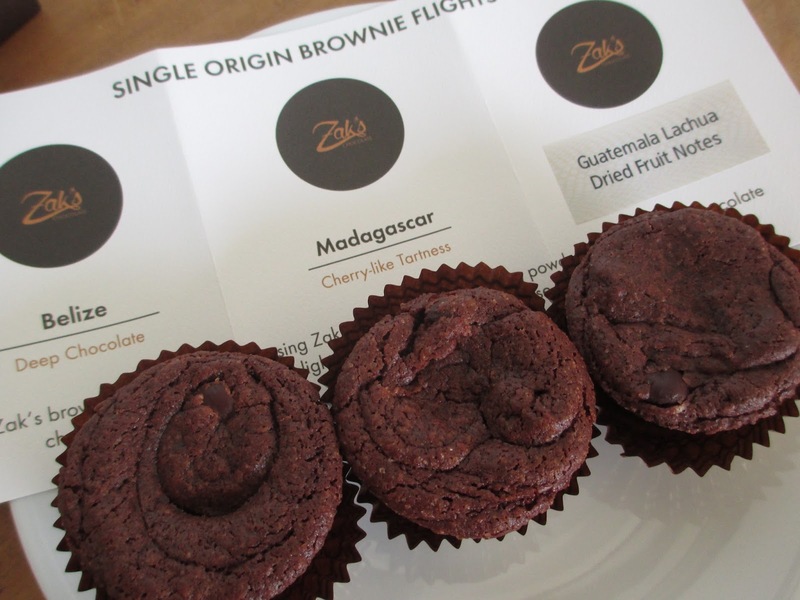 You can either get just one brownie or you can choose to get the whole Single Origin Brownie Flight. I think we all know what choice I made. You can also choose to get the brownies either frozen or heated up. (Here I'll give a note that I don't mind frozen products: freezing things keeps them fresh for when they're wanted. I prefer using freezing for preservation versus adding preservatives.) Since I wasn't planning on eating them right away, I went with the frozen option. They suggested heating them up in the microwave to melt the pieces of chocolate that are inside the brownies, but given that I don't use microwaves I heated them just fine in the oven instead. The brownies are about "brownie bite" size or a little bigger and shaped round instead of square. This lends more of an elegant touch and makes each one look more complete: there are no raw, cut edges implying that you're missing out on the rest of the brownie. And, of course, you get a different texture if each brownie is baked on its own versus as one part of a large sheet. The brownies come in a brown box sealed with a sticker; you also receive the little tasting paper to remind you which brownie is which. Moving left to right, you begin with the Belize, which comes with the description "Deep Chocolate." With the brownies fresh out of the oven, the little pieces of chocolate inside were completely melted and the rest of the inside was soft and almost gooey from the heat. The outside was more crisp. I can never decide what I think of adding chocolate pieces to brownies (versus mixing melted chocolate in with the other ingredients); I don't use this method when I make brownies myself. But Zak's uses them in order to show the differences in the flavor of the brownies based on cocoa origin. So for them, this method works well. The Belize brownie is indeed the more straightforward-tasting of the three. It delivers a a sold, rich chocolate flavor; I didn't really find other flavor notes in there, except what I refer to as a reddish tone to the taste. It's a lovely brownie. Next is the Madagascar, with "Cherry-like Tartness." The moment I tasted this one, I wanted to say that it was a little sweeter or maybe milkier; I think, though, it's just simply not quite as dark as the Belize. It is, however, nicer to taste after the Belize instead of before because it does have more flavor notes. Perhaps they put words into my mouth, but I do find a definite cherry flavor to this brownie. From a certain point of view, it is so much like an ice cream sundae (or like the non-physical concept of a sundae). Just a touch of a hint of creamy milkiness to represent the ice cream, the chocolate to represent fudge, and those cherry notes in place of a cherry topping. While I certainly do agree with the cherry part of the description, I don't find this brownie tart; the cherry flavor note is more of a fun flavor twist than a touch of tartness. It's all light and upbeat and cheery. Cheery cherry. There is, however, a different depth to the Madagascar than to the Belize; there's a little hint of flavor that reminds me of cocoa nibs. It's an extra push of flavor that really does build off of the experience of the first brownie. The final brownie is the Guatemala Lachua, with "Dried Fruit Notes." This one instantly tastes deeper, like what I refer to as blue flavor notes (as compared to red). They say dried fruit, but these flavors remind me more of what I consider the floral notes. I admit, I usually less prefer this "blue" side of chocolate, but it is interesting to find in a brownie. I'm not used to finding these particular flavors in this context. So this brownie truly brings the concept of single origin brownies into full force; this is brownies like I've never had them before. I would put this brownie closer to nibs and cocoa powder than the other two because it is closer to having a bitter flavor. In fact, I'm going to guess that while most people will love the first two, this one might be a tad too dark for some palates. So just keep that in mind if you're only choosing one brownie and not the whole flight. This would be a great set to order if you bring a friend or two to the shop and you're planning to eat there. Or you can get them boxed up and have the same wine-tasting-like experience at home, maybe after dinner. For me, half of each brownie was enough. I had to restrain myself on the first two because I really wanted to eat more of those, but by the time I got to the last one I was glad I'd kept to just half. Eating just half of the three brownies was all I could eat at one time, so you can probably share a set with another person. It isn't that the amount is too much (and there's certainly no sugar rush because there isn't enough sugar for that); it's just that the richness of the chocolate becomes . . . enough. At first I did consider getting just one brownie, but now I'm absolutely glad I got the set (it's just under nine dollars for all three, by the way). They're designed as a set, and you get a whole experience out of tasting all three together. After that, you can see if you had a favorite that you want to get by itself later on. My favorite was probably the Madagascar. So, yes, my excitement over visiting this shop has not diminished. Instead, I'm pleased to find not just good brownies but brownies that offered me something completely new and different to what I've had before. Next up: truffles.